By knocking down the offices, pub & almshouses on Blackfriars Road, does this mean there will be another glass fronted faceless building with super flats for the super-rich, while those who live in social housing can live elsewhere? It will rip the heart out of a local community. I understand the local trend is to build all social housing in Peckham, away from the community areas that have lived on this side of the river for generations. Flats will be bought by the seriously rich who rarely contribute to the local community. We should keep these buildings as they are. I find this quite scary that these things get decided and we have to live with the works and then the final building! I live in Nicholson Street and we have had so many disruptions. Firstly, with the two new hotels opposite we have all the lorries and trucks in our street, which a tiny little street. Also, we had various times the road was actually closed (on one occasion we had a family funeral and had to ask them to make space for the funeral cars!!!). Now, although the hotels are finished, we have noisy cab drivers from dawn till dusk parked up outside our house, waking us up sometimes and using our bins!! The powers that be don't care that we lost small family run shops in The Cut to make way for Sainsburys and they don't care for local peoples needs or lives. Over the years we have made friends with the people in Edward Edwards - our family has been here since these we're built in 1976. I live in Quadrant House and felt physically sick when I saw the article on this website. How can these things be decided like this and we find out by accident? Why are people's homes considered to be disposable? Suziq, I did think twice about running the story and I'm sorry if it caused you distress - but on Balance I thought it was important to get the information out there, and the material quoted in the story is in the public domain via the Blackfriars SPD document. James - thank you for your thoughtful reply, but my comment wasn't aimed at you or the good work of the SE1 website. It was just such a shock. It's been a matter of concern to me for some time now (and a great number of other people as well) that developers seem to be able to do want they want, when they want, and that Southwark Council appears to back them all the way, regardless of the people whose lives are affected. I've been sympathetic to the situation other council and housing association tenants have been finding themselves in over the past few years, now it seems I'm about to find out first hand exactly what it feels like to be made to move from a flat and an area that I love. 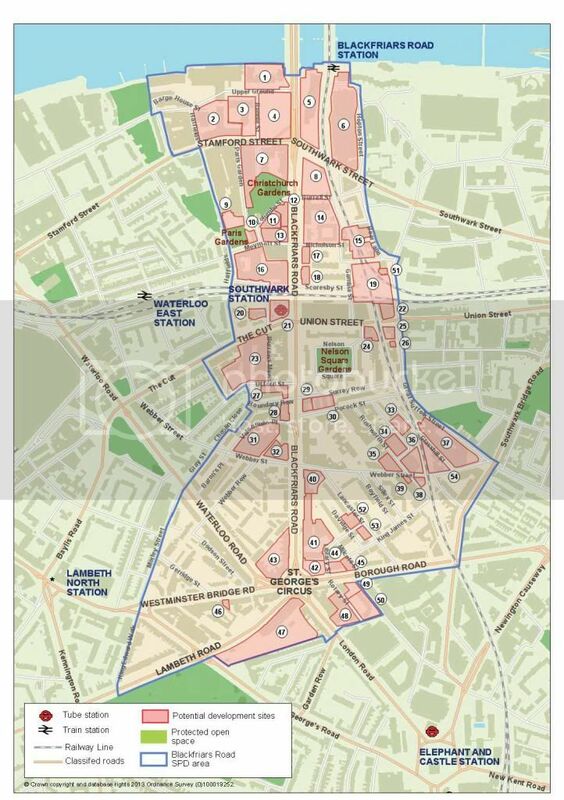 I took the map from the public document on Southwark website, here is what our council has seen as "potential development sites" in the Blackfriars Road area, all the bits in pink. Basically everything in other words. Sorry that the image goes over the margins, was hoping it could be a clickable smaller version first. in their responses to the council, several developers give away a few details about their intentions for the area. I've highlighted the proposals for this site and the Bakerloo line depot but there's more if you plough through it all. "We have also made it more clear within the fact box that whilst residential development can play an important role in ensuring the vitality of town centres, is not a main town centre use when planning for competitive town centres which need to provide customer choice and a diverse retail offer and experience in the context of Southwark’s Local Plan." So our homes are not regarded any more as "a main town centre use"? Is this what we elected this Council for? Is it the agreed will of both the Labour administration and the (mainly Lib Dem) opposition? Hello from BARD, or Blackfriars Action for Responsible Development. We are a community campaign run by local residents and have been in existence since November 2012. We initially got together in connection with the proposed development in 169-173 Blackfriars Road. While we did not manage to stop Southwark Council planning department granting planning permission for the site, and the loss of the former Imbibe bar building, we did manage to reduce the proposed height from 27 storeys to a smaller development. It has been our intention to continue to campaign for responsible development in our area, that will also take into account the needs of the current residents of the area. We have also been discussing and commenting on the Blackfriars Road SPD in our meetings, and our members have sent critical comments about it during the consultation, unfortunately with very few visible results. The council seems to be pushing this SPD very hard. With this much development and demolition in the area from Elephant to the river via Bankside, Borough and Bermondsey, in 20 years the entire demographic of that area will change. The more sites of office and expensive housing their are, the more pressure will be put on council tenants and leaseholders to be 'decanted' and moved elsewhere by the Council. Individually, new build offices and apartments seem just to come and go but if you link all these sites of potential development, then the picture is pretty bleak. It's worth keeping this wider picture in mind. If 1100 homes can be lost at Heygate with little fuss and battle, then whatever next in North Southwark? Who next for 'decant' and displacement as new more fancy office and residential buildings and the attendant services (delis, galleries, farmers markets, coffee shops, hotels, boutiques, gyms etc) put the pressure on. Nelson Square? Falcon Point? Any council blocks near to landmark sites and developments such as Tate Modern, NeoBankside and so on.